Oh, my, look what happened when I turned Card Trick into a three sided block! 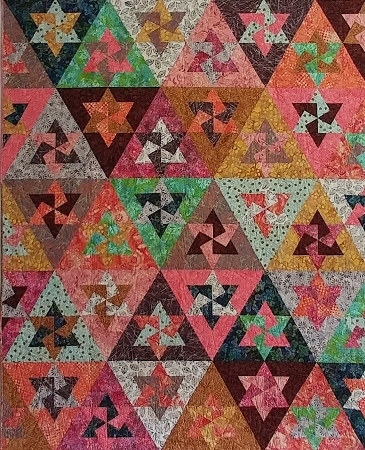 The Starfecta block has three sides, three shapes, and uses three fabrics. Wow, that is more like a “trifecta” except the coloring forms a “star”, hence Starfecta. Start with 15 fabrics how many combinations are possible? You will need an Angle Trim Tool. · (15) ½ yards of assorted solid, semi-solid or batik fabric. · There will be a fair amount left over to make scrappy binding. My thoughts on color: Choosing fabric within a wide or narrow color band with a few fabrics that “read” the same may help keep the quilt from looking scrappy. I threw in a couple of “wild” card colors as well to add a bit of unexpected.